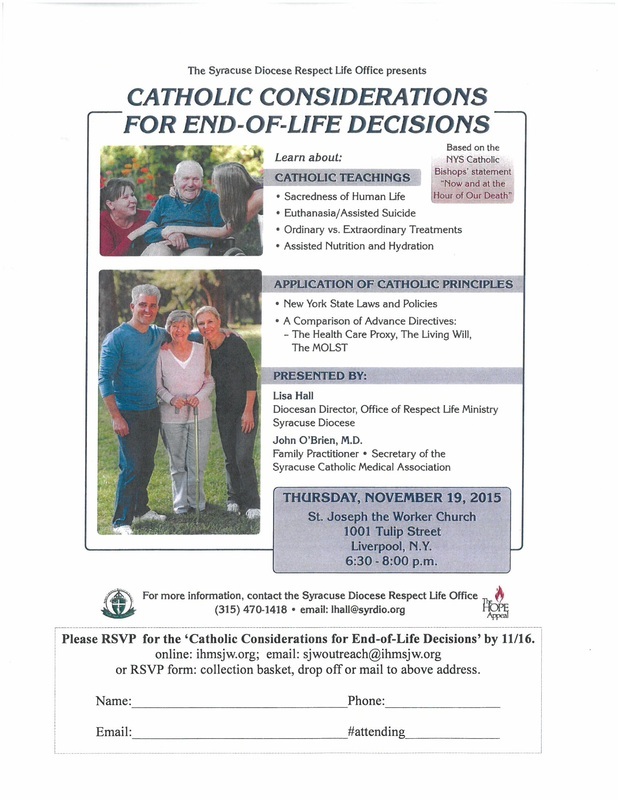 RSVP for 'Catholic Considerations for End-of-Life Decisions' by 11/16. Aging and Religion Panel: Perspectives on aging and religion will be presented. Finding purpose compassion and peace. Wednesday November 4, 2015, 2:00 p.m. to 4:30 p.m. Meaningful Activity for Aging Gracefully: Occupational Therapists will look at the whole person, their roles, values and willingness to participate. Monday, November 30, 2015 from 2:00 p.m. to 4:30 p.m.
All classes are being held at the Country Inn and Suite, 1100 Danby Road (Route 96B) Ithaca NY. The cost is $25. per workshop or $15. per workshop for retired individuals. Questions Please call Teri Reinemann at 607-274-1607.